Big Congratulations to 41 year old, mother of a 2 year old, Dara Torres! Setting a new American Record in the 50m Freestyle at the US Olympic Trials this week. She just seemed so cool and down to earth, got to dig that! I'm such a sucker for the Olympics and especially the "Olympic Moments" that NBC does such a great job of uncovering/cultivating. I'm hoping that Northside Hospital has NBC in the birthing rooms, just in case we are in labor during Swimming and/or Track and Field coverage. In other news, found out about a fun website today: http://www.freerice.com tests your vocabulary and for every correct answer 20 grains of rice are donated to the UN World Food Programme. I'm a total vocab dork, so I think it's one of the best way to "take a break" during the day. Finally, in workout news... the recumbent bike is getting a little uncomfortable, the ever expanding belly is in the way... 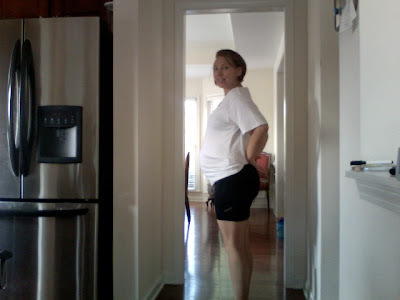 I can only take about 20 min, so I've started the pregnant lady triathlon... swim, recumbent bike, walk on treadmill. I'm still doing some light weight lifting, while receiving from fairly interesting looks from some folks. All in all, feeling really good. Now I just need to get the baby's stuff in order, and I will feel more prepared for the big event! 7 weeks to go... and actually only 3 weeks to the "red zone".